In Hong Kong for World Baijiu Day? 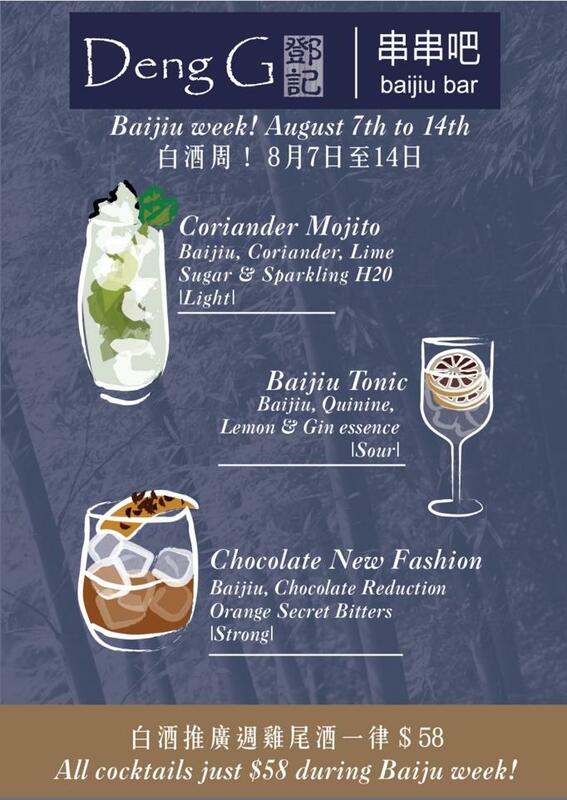 Visit the the baijiu bar at Deng G and try the three featured cocktails by Hektor Monroy. And if you can’t make it on August 9, no problem, as the special will run from August 7 to August 14. The cocktails include a Chocolate New Fashion (a twist on the Old Fashion), a potent Coriander Mojito, and a light and sour Baijiu Tonic, all at HKD58 per drink. Francisco Barria, who handles PR for the venue says, there are also plenty of baijiu options for those who prefer their spirits neat, including a tasting flight. Deng G, 2/F, 147 Queen’s Road East, Wanchai; 852 2609 2328, Sun-Fri 12 PM- 2:30 PM, 6 PM-10:30 PM, Saturday, 6 PM-10:30 PM.